Using a 50/50 funding grant from the Florida Department of Transportation, VPS replaced 50,000 square feet of carpeting and purchased 5,000 square feet of overstock pieces for future replacements. Total cost for the project was about $321,000. Area Covered: 50,000 sq. ft.
Rogers had two goals for the new carpeting: capture the public’s attention, like Portland International Airport did with its popular, kitschy design; and emulate the nouveau wave pattern of the carpeting at Hartsfield-Jackson Atlanta International Airport. “We wanted to take a mundane, run-of-the-mill project and turn it into something special—that was a driving force,” says Rogers. 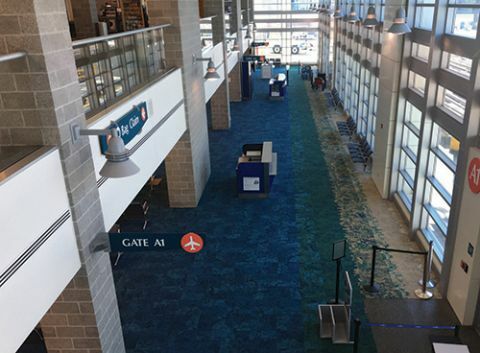 The airport turned to Interface, a carpet designer and manufacturer based in Atlanta, for a product to highlight the best the Emerald Coast has to offer. 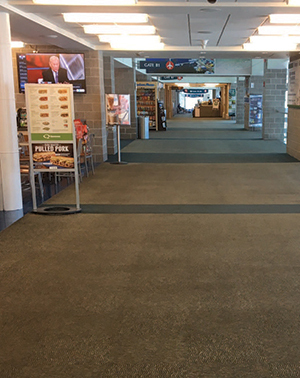 Because VPS is located in an area known for some of the world’s best fishing, airport management wanted the new carpeting to be sourced from environmentally friendly materials. Net Effect, a line of carpeting tiles made from discarded fishing nets, proved to be a perfect fit. An initiative called Net-Works coordinates the collection and sale of fishing nets that litter the beaches and waters of small villages in the Philippines. The program provides a source of income for the fishing villages and helps clean up the area, including an offshore double barrier reef. Interface’s yarn supplier, Aquafil, repurposes waste nylon from the nets and other secondary sources to produce materials that are ultimately used to manufacture Net Effect carpeting. To highlight the environmental stewardship of the finished project, Interface presented the airport with two certificates: a Cool Carpet™ certificate, which documents that the material purchase resulted in the retirement of 63 tons of verified greenhouse gas emissions through reduction credits; and a ReEntry® certificate, which recognizes the airport for recycling the 38,505 pounds of old carpeting that was removed from the terminal rather than sending it to a landfill. 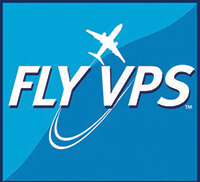 Rogers worked directly with Interface account executive Katherine Thomas on the custom design for VPS’s new carpeting. Because the airport had such a specific vision, the design process took four months instead of the typical two weeks. The resulting product has a blue, green and sand color scheme that mimics the water, plant life and beaches throughout the region. Thomas describes the pattern as very organic, featuring different heights and textures to create a 3-D effect that looks like the waves in the Gulf of Mexico hitting the shore. After airport management committed to the pattern, Interface’s concept design team created custom hues for the sand and blue tones needed to honor the Emerald Coast. To create the desired effect, the pattern starts with “sand,” which fades into colors representing the region’s clear blue water. For Rogers, it was especially important that the pattern of the new carpeting not be interrupted when a tile or two needed to be replaced due to damage or standard wear and tear. Interface’s i2 line addresses that very concern. Using the principles of biomimicry, designers take inspiration from the appearance of a leaf-covered forest floor to vary the use of pattern and coloring within one style and color scheme. As a result, tiles blend together no matter when they’re installed, explains Thomas. The tiles also create a more efficient installation process, with 90% less waste than traditional broadloom carpet, easy reclamation and recycling, and the need for less replacement stock, she adds. During installation, VPS decided it wanted to use durable vinyl tile instead of carpeting in areas that bear the brunt of rainstorms and other inclement weather. The pattern it selected portrays the wooden planks of a fishing dock. Removing carpet tiles that had already been installed in the baggage claim area added about $5,000 to the overall project cost, but airport personnel are more confident about the long-term results. Interface managed to create a seamless connection between the carpeting and vinyl tile without using transition strips, notes Rogers. In addition to improving the appearance, this eliminated a common tripping hazard and pieces that are often damaged by rolling luggage, he adds. Considering how satisfied VPS is with the final result, Thomas encourages other potential clients to request custom designs and product combinations.